Share the post "Online Business"
♦ Conventional business will require the guest to either walk-in, send email, ask using Facebook Chat, or make a phone call to check for the room availability / occupancy within the desired date since there are no other options for that purpose. The hotel representative needs to check, and revert back to that guest with the appropriate information. ♦ Online business will provide the guest with the check-in and check-out date checking features normally on the hotel web pages or mobile apps. Guests can only visit that web site and specify their desired date range. ♥ That hotel needs to spend time on dealing with replying email and phone calls to check for the room availability, while the guests have to spend budget for their telephone bill and time if that hotel did not adopt online business. ♦ Conventional business requires the hotel representative to manually create invoice whether by using hand-writing, or application software. Then that invoice needs to be sent to the guest. 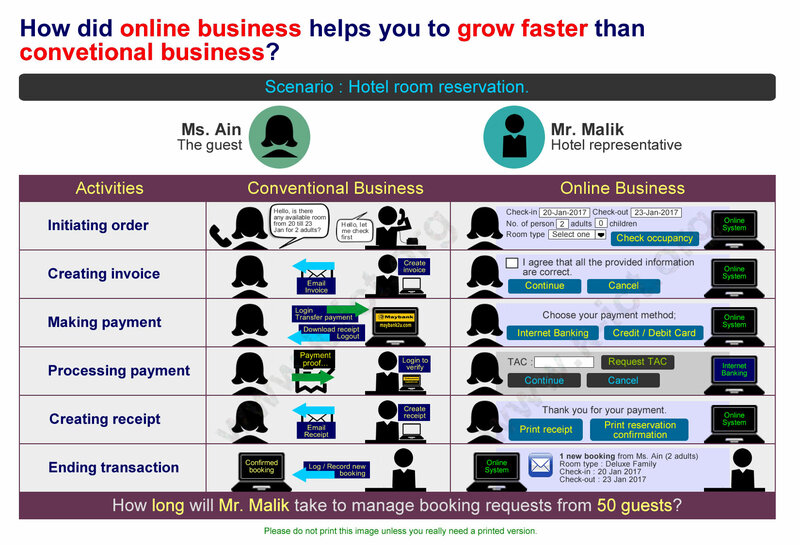 ♦ Online business will automatically create / generate invoice based on the information specified by the guest including holidays duration, number of person, and type of room. ♥ That hotel representative needs to spend time on creating and sending invoices to the guests, while the guests have to wait for that invoice before able to make payment simultaneously confirm the booking if that hotel did not adopt online business. ♦ Conventional business requires the guests to manually log in to their Internet Banking account, visit the nearest bank branch or cash deposit machine, and provide that hotel bank account number. Guests need to bare the bank service charge if their bank differ from that hotels’ bank, while that hotel may need to wait for the next business day. ♦ Online business does not care whether both guests and hotel have same bank account or not, and the guests will normally not charged. ♥ That hotel needs to spend time on waiting for the guests to make the payment, while the guests have to spend their time to log in, provide that hotel bank account number, and the Transaction Authorization Code (TAC) if that hotel did not adopt online business. ♦ Conventional business requires the guests to manually send payment proof to the hotel after making the payment, while that hotel need to verify them by logging in to the Internet Banking account. ♦ Online business will automatically notify both the guest and hotel via email for every transaction performed whether they are successful or not. ♥ That hotel needs to spend time on verifying payment / transaction slips and updating booking status, while the guests have to spend their time to send the payment proof and wait till their payment get verified if that hotel did not adopt online business. ♦ Conventional business requires that hotel to manually update the invoice payment status from “UNPAID” to “PAID” once they successfully verify the payment, and send that receipt to the guest along with the booking / reservation confirmation. ♦ Online business will automatically generate, update, and send the payment receipt to the guests via email on every successful transaction. ♥ That hotel needs to spend time on filing purposes, while the guests have to spend their time waiting for that receipt and booking confirmation if that hotel did not adopt online business. ♦ Conventional business requires only the hotel to manually log / record the payment, and booking status. ♦ Online business will automatically update the desired rooms as “Not Available” or “Reserved” to the public hence block other guests to book those rooms within the desired date range. ♥ That hotel needs to spend time on updating date-room availability if that hotel did not adopt online business. Online business helps you to grow faster than conventional business because most processes are automated, and reachable over the world. is the free and stable combination tools to setup your online business. Click here to download our plugin at WordPress. Alternatively you can use OpenCart or HikaShop. 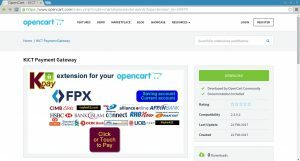 Download our plugin at OpenCart. Download our plugin at Joomla Extension Directory.